I have a rash. On my upper left arm. It was on the upper section of both arms when I originally saw it, 1 day over 5 weeks ago now, but the right arm has cleared up considerably. Except for the red dot I noticed this morning which may or may not be the same thing. I work with medical doctors and I use their knowledge shamelessly. They can not treat me, if treatment is needed, but I use them to decide if treatment is needed, antibiotics or testing. 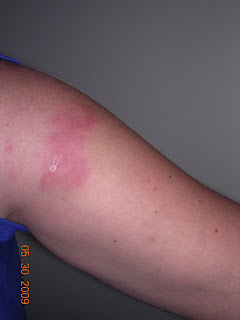 I showed 4 of them this rash. They all said the same thing, "Hmmmm, isn't that interesting." Not helpful at all. One said it looked like bed bugs. It isn't, but it does look like the pictures of bed bug bites on the 'net. My rash does not itch. It is possible that I have had it for more than 5 weeks, because the only way I noticed it was looking into a mirror without a shirt on. So 2 weeks and 3 days ago I went to see a dermatologist. Ok, a dermatologist's P.A., but it was in the dermatologist's office. She said, "Hmmmm, isn't that interesting," and took a plug out of my arm. This is called a punch biopsy, because it is like using a hole punch to remove skin. I didn't look until the 2 stitches were completed. I had no interest in seeing down to the fat layer of my arm. The PA called me on Tuesday 19 May, 6 days after I was there to tell me the biopsy showed a "collagen vascular disorder." I wrote it down, so I could google it later. Then she dropped the bomb, "Lupus." She did explain that this was not certain and that we would need blood tests to confirm or refute this. I was still slightly hysterical, but my work doctors said not to be. They did say she should never have mentioned the word, but that blood tests would probably show this was incorrect. So off I went to give blood on the 20th, expecting the results (because that is what I was told) on the 22nd. Nothing. I waited patiently until Thursday the 28th. Then I called. Then I played phone tag, then the PA called again and told me it was fact. I have Lupus. Except I may not have it. My work doctors, without access to my lab work, said the chances that one test proved Lupus was slim. My family doctor, who finally had to send someone to the dermatologist's office to pick up my paperwork, because only 2 of the 3 pages had been faxed to them, said it was possible, but not all that likely. So I gave more blood yesterday and I have a follow up appointment with my family doctor next Thursday, the 4th. Hopefully I will have some answers then, but it is possible that I will only have more questions. I know how scary it is to have something wrong physically and not be sure what is causing it. You're in my thoughts... try to take it one moment at a time. In the timeframe of a year I have had one MRI, a CT scan and an ultrasound. I have also seen about four different specialists for various and sundry things. I spent the majority of that time living a sedentary life and one in worry. The waiting always sucked. However, I always have thought, during that period, that if it were worst-case scenario, at least I would then know what was going on and then could figure out how to deal with it. I hope they're wrong about the Lupus. I'll keep my fingers crossed for you. Sometimes it is so amazing that medical science has come so far and yet not far at all. Uncertainty is always the worst, especially when they drop the bomb on you. When I was 19 or 20 years old, I got a message regarding a PAP that told me I needed to make an appointment with a particular doctor, the message also told me that this doctor was an oncologist...so I spent weeks worried about cancer that I did not have. Best wishes as you go through this. Недавно стала всё больше размышлять над такой ситуёвиной: а что если бы во всём мире пропал интернет. Я конечно понимаю, что интеренет сам по себе взять и испариться не может, но всё-таки, если опустить все технические нюансы, и представить что такое возможно... Теперь не почитать новости, блоги, не найти нужную информацию в Яндексе, а самое страшное не выйти ни в ICQ, ни в контакт! Задумались о подарочках на юбилейчик ребенку, ему 3 года, всевозможные-роботы-конструкторы у него есть много, он любит мышонка Тич. Я откапала типа подобной игрушки, только мишку -медвежонок Куби, кто-либо покупал такого? Есть смысл брать? Или посоветуйте что-либо еще. Не дайте сыну остаться без праздника от папы с мамы с папой. I Like Sharing Good News!